Sen. Baucus was among the five Democrats who voted against adding a public option to the health care bill. WASHINGTON (CNN) - The Senate Finance Committee on Tuesday rejected an amendment to include a government-run public health insurance option in the only compromise health care bill so far. The amendment by Democratic Sen. Jay Rockefeller of West Virginia fell by a 15-8 vote, with committee chairman Sen. Max Baucus of Montana and four other Democrats joining all 10 Republicans in opposing the measure. The other Democrats voting against the public option amendment were Sens. Blanch Lincoln of Arkansas, Bill Nelson of Florida, Kent Conrad of North Dakota, and Tom Carper of Delaware. It was one of two amendments for a public option proposed by Democrats, and the committee immediately began debate on the second amendment proposed by Sen. Charles Schumer, D-New York. Baucus explained he liked much about the idea of a public option, but he knew a health care bill containing the provision would fail to win enough support in the full Senate to overcome a Republican filibuster. 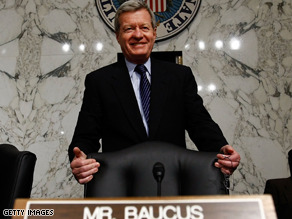 "I fear if this provision is in the bill, it will hold back meaningful reform this year," Baucus said. UPDATE: The Schumer amendment on the public option also failed. It drew the support of 10 Democrats, including Carper and Nelson. Baucus, Conrad and Lincoln joined the GOP vote against it. Have a nice day to the public option!! Health Care reform should have the been the first project that Obama tackled. Now the country has quadrupled its debt. Those who voted against the public option...take their Gov't run insurance away. Then see what happens. It appears that the republican conservative Christians and Fox entertainment have gotten their way on this. Both turn their back on Americans to ensure health insurance companies get outrageous profits. Healthcare reform without a public option is worse instead of better. I swear I will not vote for a dem who votes to pass such an idiotic thing. I'll vot repub if I have to because, after all, what's the difference? socialists and union members are very disappointed now – maybe they should just move to russia. The Democrats need to use the reconciliation option to push through health care reform that is so badly needed. The Republicans used the reconciliation tactic to push through tax breaks for the wealthiest Americans which led to record budget deficits. I think it's time to use the political capital from the last election to solidify the Democratic agenda for the "vast majority" of Americans. public option is a good idea . lets have a nationalized insurance. Possibly the fact that the opponents of the Government Option fielded at least ten time the mass in phone calls and rallies had something to do with this. Politicians are reluctant to sacrifice their careers on the alter of the socialistic ideal.